A buffer tank is a vessel that is used in a heating system to contain a volume of heating system (primary) water. It is a particularly important component of a heat pump system, reducing the number of starts and stops that the heat pump has to make in order to meet the property’s heat load, in turn helping to increase the life-span of the heat pump. What is a buffer tank for? A heat pump system is designed to work continuously, adding just enough heat to keep the building up to temperature. This is fine during the depths of the heating season when the building heat loss is close to the design condition and the heat pump needs to tick over. However, in spring and autumn when the property’s heat loss is lower, the heat pump does not need to keep continuously adding heat. In these warmer months, the additional volume that a buffer tank provides gives an extra load for the heat pump to work on. Once it has satisfied this load, meeting the demand, it will switch off but the buffer tank will continue supplying heat to the property. This means that there will be a longer period of time before the heat pump will not need to switch back on. In most heat pump systems there are two main circuits: one around the heat pump, and one around the heat emitter (most likely underfloor heating). There are different design requirements between these two circuits (the water temperature difference and hence flow rate), and yet they have to interface. The buffer tank allows the two circuits to be designed independently, allowing an installer to think of each circuit as its own entity, with a different flow rate for each, and yet the heat gets from one to the other. Does every heat pump require a buffer tank? Every heat pump system designed and supplied by Nu-Heat includes a buffer tank, whether it’s our space-saving buffer box that can accommodate a cylinder sat on top, a wall hung option or a floor-standing tank. 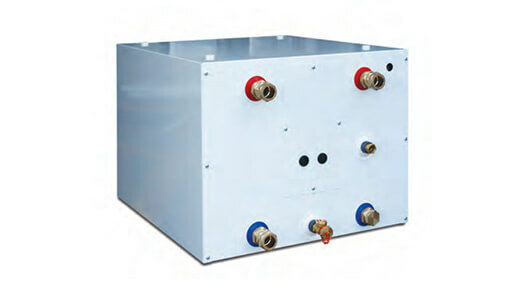 The choice of buffer tank is sized according to the heat pump capacity and model requirements during the system design.